If a proposed scheme had gone the way a group of businessmen had wanted 170 years ago, there wouldn’t be a Regent’s Canal today. The eight and a half mile stretch of water between Little Venice, near Paddington, and Limehouse Basin would have been drained and converted to a railway line. Fully opened in 1820, the Regent’s Canal was promoted by businessman Thomas Homer to link the Grand Junction Canal that terminated in Paddington with London’s docks to the east. It was built in collaboration with the architect John Nash, who was a friend of the Prince Regent (hence the Prince giving permission his name to be attached to it) and James Morgan was chosen as the scheme’s engineer. The Regent’s Canal boomed soon after its opening, but it came just as new railways were being planned and built in the capital (Euston, the first of the new north London railway termini, opened in 1837 for example). And so the canal soon faced competition. Toll charges were cut, but commercial traffic was quickly taken by the railways. “The vast importance of this undertaking, whereby a junction will be effected between all existing and projected railways north of the Thames, combined with the advantage of a General City Terminus, is too obvious to require comment. By the proposed railway, passengers and goods will be brought into the heart of the City at a great saving of time and expense, and facilities will be afforded for the more expeditious transmission of the mails to most parts of the kingdom”. And although the company failed, the Regent’s Canal faced many uncertain years as a waterway. Other companies (including the Central London Railway and Dock Company in 1859) were formed either to turn the route into a railway or build a line alongside the existing canal. Somehow the Regent’s Canal survived being swept up by railway mania however and, after passing through various different owners, it was eventually nationalised in 1948. To discover more about the history of the Regent’s Canal, I walked its eight and a half mile length. The first leg took me from Little Venice to Islington. 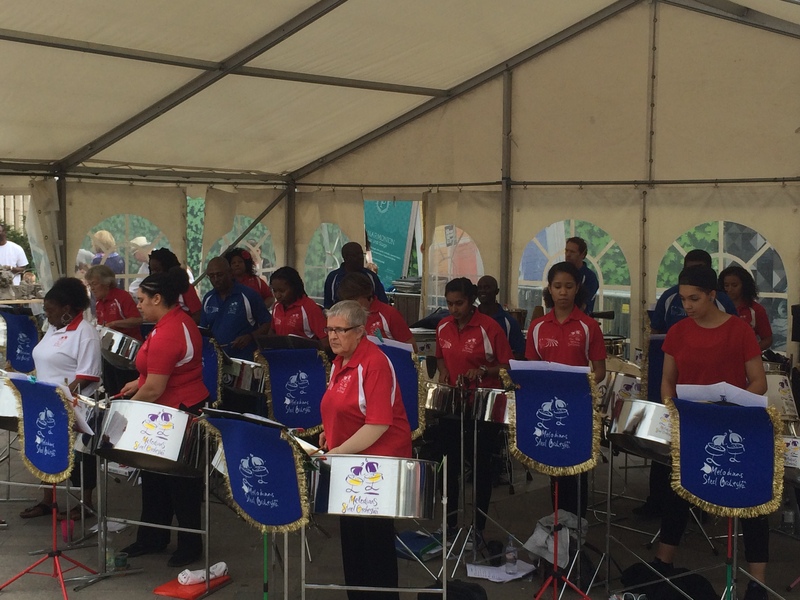 And in next week’s blog I’ll conclude the trail by walking from Angel to Limehouse Basin. I started my walk at Paddington station. Emerging from the new entrance to the Hammersmith and City line platforms, I found myself right by the water’s edge, a stretch surrounded by modern office blocks and lined with canal boats. This wasn’t quite the Regent’s Canal yet though. Today, the area is being marketed as “Paddington Central”, but when it operated as a commercial canal it was known as Paddington Basin and was the terminus of the Paddington branch of the Grand Junction Canal. Cargo was loaded and unloaded here, so it could either be transferred into warehouses or transported along the New Road towards central London. Regent’s Canal proper starts a little further on at Little Venice, a lively area where the waterway meets the Grand Junction (which as I found on a recent walk was built to connect the south to the growing industries in the Midlands). I’m a big fan of walking along canal towpaths, but found the first stretch of the Regent’s Canal pretty frustrating. 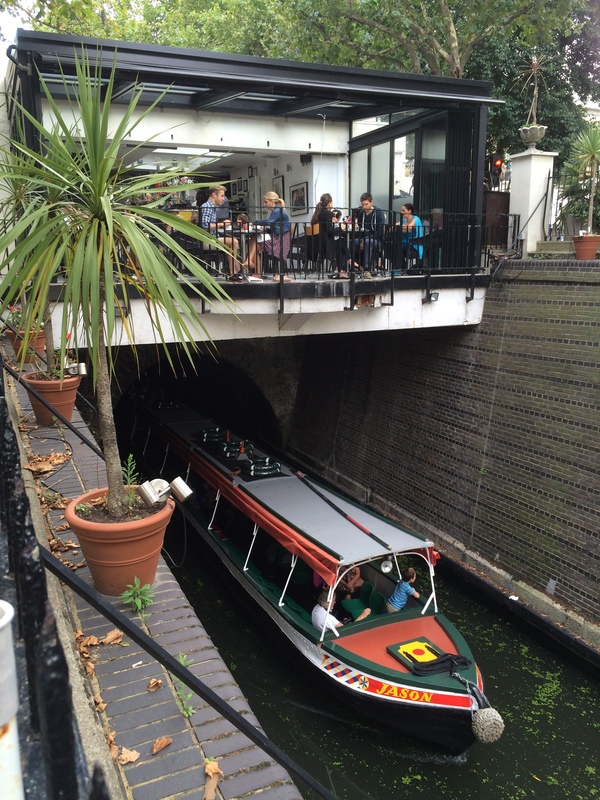 Soon after Little Venice, the path was closed off to the public (only residents living on boats here with a key could pass through the locked gates) and then we hit the Maida Hill tunnel, so there was no place to walk by the water. The walk only really got going as the path approached London Zoo (opened in 1828), nestling on the edge of Regent’s Park. It was quite surreal walking through a stretch of water with animals in cages on either side of the canal (zoo visitors cross a bridge to move between the two sites). 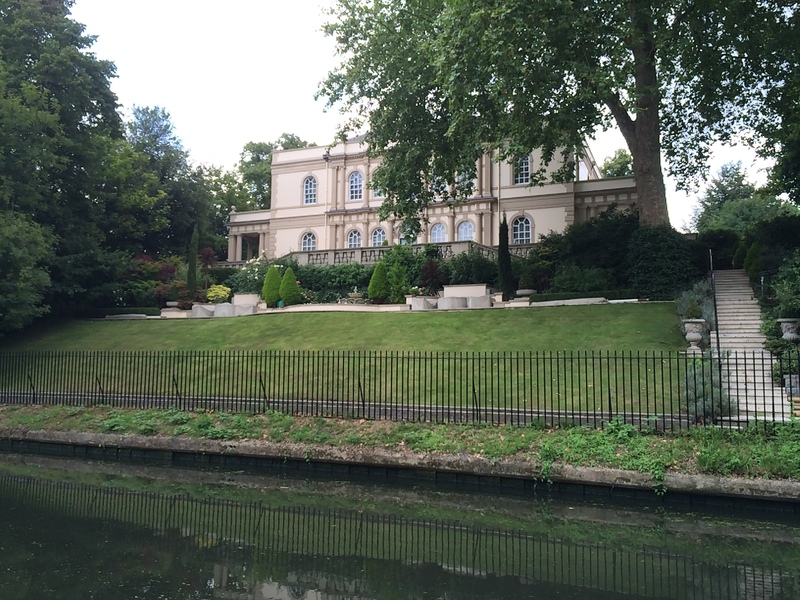 I also passed some grand detached houses, set back from the canal, with extensive gardens leading down to the water. Built in the early decades of the 19th century in Regency style, their appearance harked by to classical Greece, with many featuring Grecian columns. The outdoor terraces overlooking the canal seemed the perfect spot to entertain guests, but nobody was about when I passed. But the peace and quiet I had been enjoying quickly disappeared at Camden Lock market (interestingly there are actually three locks in this area, but none of them are officially called Camden Lock). The towpaths, bridges and areas around the lock gates (the old lock keeper’s cottage is now a coffee shop) were crammed with people, so it was very difficult to move. 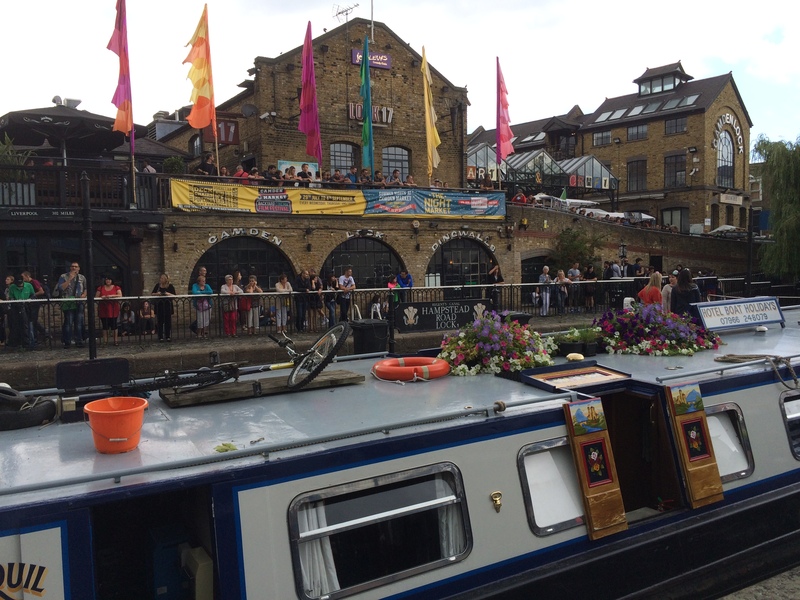 When I first moved to London, I quite enjoyed visiting Camden Lock market – part of Camden Market – for its antique, clothes, gifts and food markets, as well as bars, housed in old warehouses, with terraces overlooking the basin. The main part of the site was originally home to T.E. Dingwalls’ timber yard, with timber being unloaded from large river barges and transferred to smaller vessels. It became derelict by the 1970s and in 1972 craftspeople were given the chance to rent cheap space. And two years later the market opened – and it’s been growing ever since. This visit proved to me very clearly that the area now attracts too many visitors (granted I was there on a Sunday when it’s at its busiest), many spilling over from the street market stretching down to Camden Town, and has lost its charm. And some of the traders and local campaigners have been worried in recent years too – they say the soul of the original market is being destroyed as a result of the area being re-developed. The pedestrians and cyclists didn’t completely disappear as I made my way along the towpath towards King’s Cross, but it was thankfully much quieter. This stretch, intersected by bridges carrying busy roads such as Camden Road and Kentish Town Road, is lined by numerous plush modern apartments along the banks. As I ambled along a number of colourfully decorated canal boats passed me. 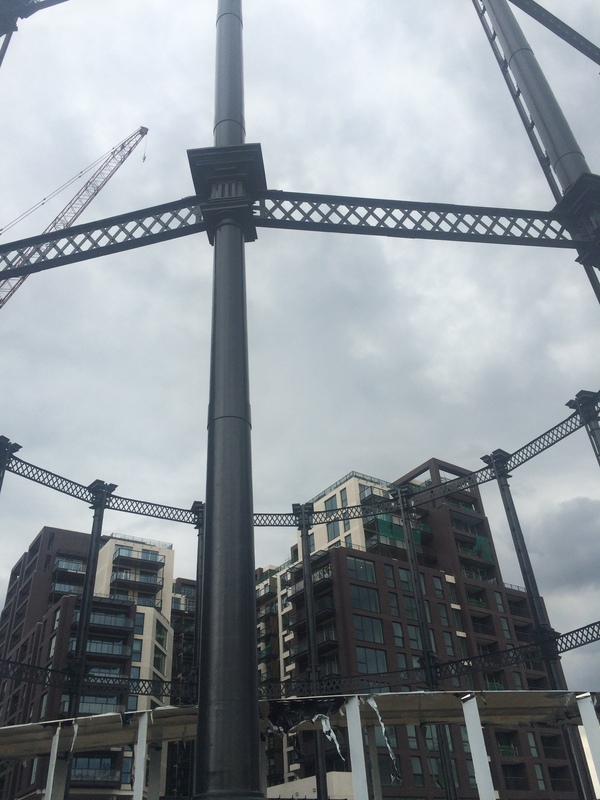 At King’s Cross, I saw how the re-development of what was once an industrial area is continuing at rapid pace. But rather than just being an area talked about as somewhere to look out for in the future, it already seems to be pulling in the crowds. As warehouses and former goods sheds are converted to apartments and offices (as well as completely new blocks built), the crowds are rolling in at weekends to enjoy the restaurants and cafes that have sprung up in recent years. Granary Square – home to a campus of the University of the Arts London – is a particularly popular draw. When I visited, people had gathered in front of a stage where a brass brand was playing in the shadow of construction cranes towering into the sky. Children were running in and out of the fountains in Granary Square and nearby many more were enjoying a clay modelling competition. If you’ve read one of my earlier blogs charting development in the area, you’ll know how much of a contrast this is to the past when this was a place of railway sidings and gasworks. I carried on my walk along the Regent’s Canal, but as I approached Angel I was blocked from going any further by the Islington Tunnel which is some three quarters of a mile long. Designed by the canal’s chief engineer James Morgan, it took navvies three years to build. The workers used a combination of explosives and their physical strength to blast underneath what is today housing estates and a market. It was opened in 1820 – when the canal was completed – with a ceremony incorporating a brass band playing as boats processed through the tunnel which were then met by canon fire as they emerged on the other side. Just as boaters’ horses were walked over the top because there is no towpath, I resorted to concluding my exploration to Angel at street level (the London Canal Museum does however run boat trips through the tunnel). Early on, boats moved through the tunnel through “legging”, with boaters pushing against the walls with their legs. After a short walk through the housing estate, I soon emerged on Upper Street and the first leg of my walk along the Regents Canal was complete.